The best way to celebrate the woman of the hour is one last party with the girls. We wanted to give you some high-design but easy to put together inspiration for the shower to make it look its absolute best. “Floral Support,” one of our cheekier bridal shower designs, has classic wedding flowers but also hints at a fun lingerie theme—and if you’re looking for a hook to your party (a tea party? Shelf stocking? ), our invitations have plenty of other ideas for you. 1. 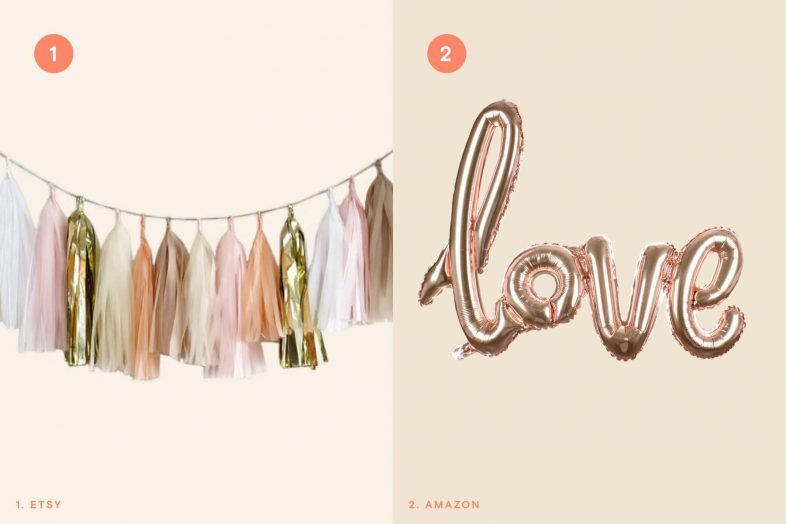 Tassel garland — A festive string of tinsel tassels brightens the room and gives you a place to hang photos and other decorations. We went with a champagne and rose gold color scheme throughout—feel free to choose your own colors. 2. Love balloon banner — Love’s the word of the day, but we hadn’t seen a balloon like this—charming and hand-lettered calligraphy is lovely on the invitation and magical when it’s floating in mid-air. 3. Fujifilm Instax — If you want to have a photobooth at your shower, there’s no need to rent an expensive operation. It barely takes any DIY, either: start with this instant camera. Pack a few extra frames, in case any shutterbugs go wild. 4. 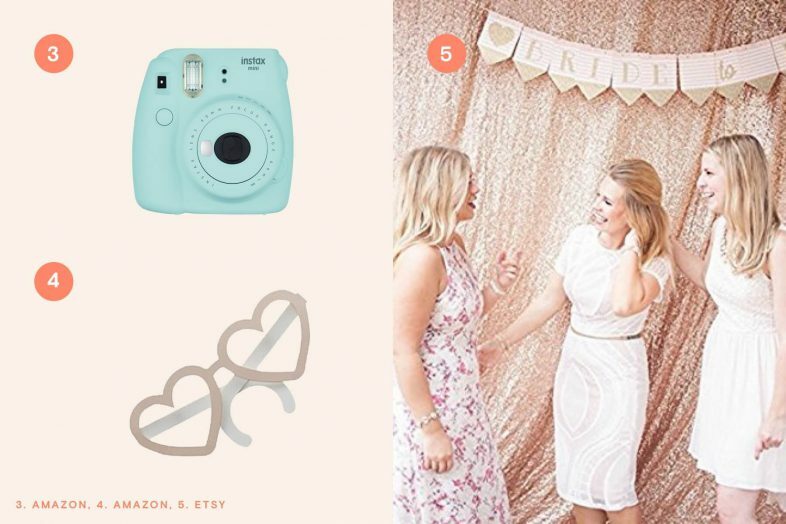 “Team Bride” photobooth props — Who has the time to assemble a lifetime’s worth of toys and props for just one party? This bundle of novelties makes a great start for a day of shooting. 5. Champagne sequin backdrop — Next, set up your new photo studio with this lovely drape. It’s also a great way to transform the room. Metallic Sharpies — And in case your friends want to autograph their portraits, keep it sparkling with these classics, updated in shimmering gold and silver. 6. Caspari plates — They look like they’re made with food-grade gold leaf, but they definitely don’t cost the same. 7. Floral napkins — To match, or add a little something extra to, your invitations and decor. Champagne flutes — The bride doesn’t have her fine crystal yet, so you can make do with surprisingly durable, and incredibly easy to clean up, plastic. 8. 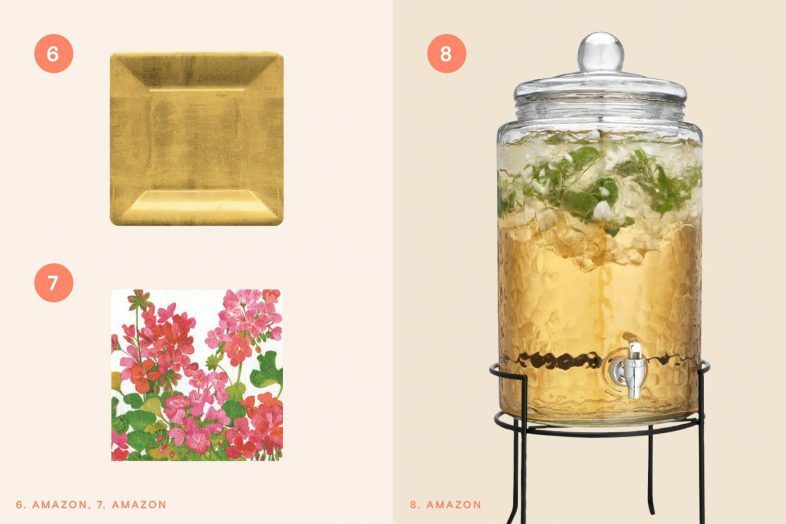 Beverage server — This might seem a bit de trop, but hear us out: It’s easy to set up, you can pre-mix punch, fruit water, or another favorite, and no one has to run between the kitchen and party for refills. Win, win, win. 9. 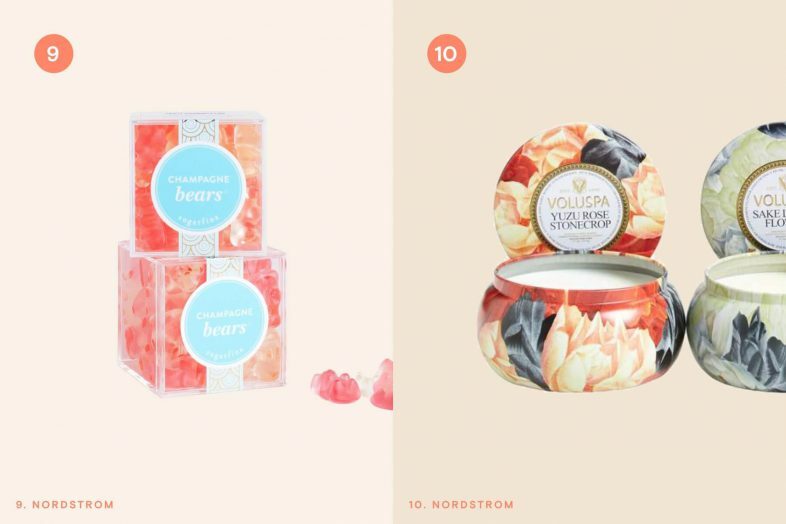 Sugarfina Champagne gummy bear candies — Cute, sweet, and just a touch adult. 10. Voluspa candles — You can’t keep the flowers forever, but you can leave your guests with something fragrant and luxurious. 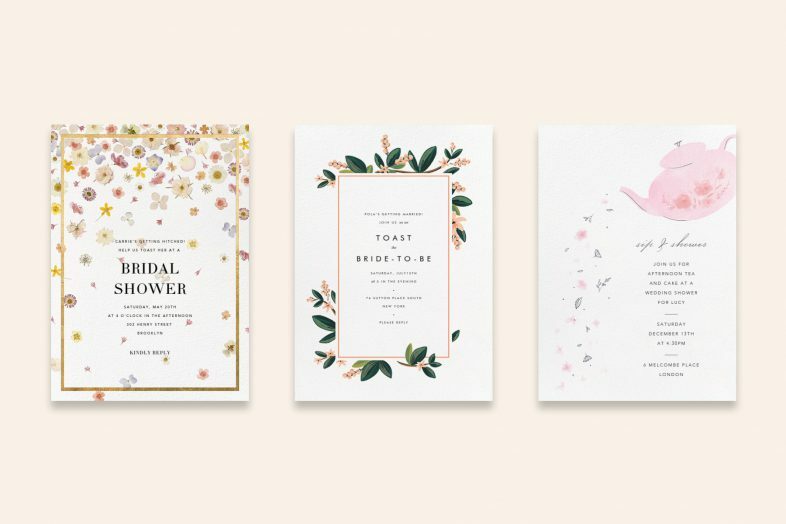 Choose an invitation that nods to classic wedding flowers: whether they’re pressed (“Vincennes”) illustrated (“November Herbarium”), whimsical (“Pouring Petals”), or maybe a bit naughty (our “Floral Support,” above). Here comes the shower: but now you’re well-prepared. 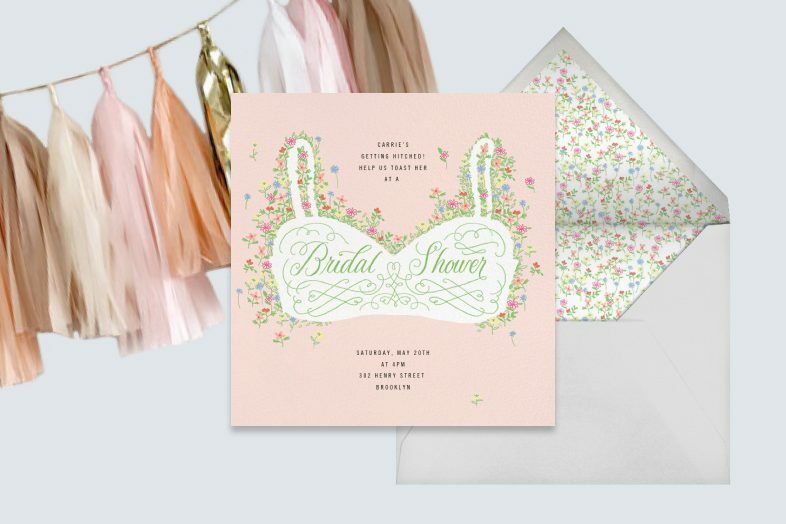 Browse our collection of invitations to every kind of wedding shower—stock the shelves, give a gift of unmentionables, or even invite both halves of the couple.